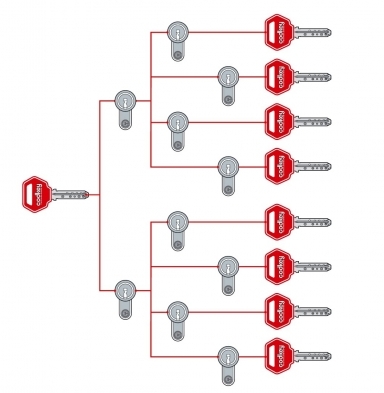 "Codkey Technologies" Ltd has specialized software building MASTER KEY systems, forward and reverse order. It helps ensure traceability at every level of the system, with the possibility of repetition of one base code. Numerical coding successfully applied to all types of fluids. Analyzing object and identify all premises in the building. When designing a Master system aims to reduce the number of keys used by the employee. It may also be used shown form. It is important to determine the exact amount of the locks required for the doors and their type (lock midfielder lock, lock handle, etc.). You need to determine the hierarchy of access to the organization, each employee to open spaces for which there is access and not to open those for which there is no access. 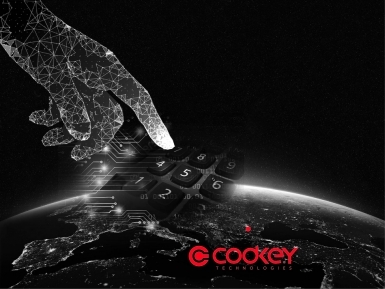 Locking systems with brand CODKEY are manufactured in European quality standard and proven technology; certified laboratory in the Czech city of Brno. Locks Codkey Technologies are protected with ID cards; duplicate key to a Master system is produced on request to supply department Codkey Technologies Ltd.
Access control is an important element of the modern work environment and Master system can control the human flow in the building, each employee has a level of access adapted to his needs and pramomoshtiya. The coded locking elements can be embedded in different types of locking systems according to need and the need of the job. They are designed for installation in furniture, cabinets, security doors, locks, gear and more. Master system is a system with the ability to adaptirakam various kinds of decisions. With one key you can open the front door of the home and the office, other facilities, mailbox, etc. One key replaces several ten. With this key facilitate communication within the facility and eliminates the need for storage backup. Loss of key can porachatesashtiya key, only your ID cards. Each Master System includes Master Key (one or more) and allows you to have quick access to doors and premises in the building emergency (fire, earthquake or any need for evacuation). Have you ever wondered how your employees use the keys and how often have their replacement? 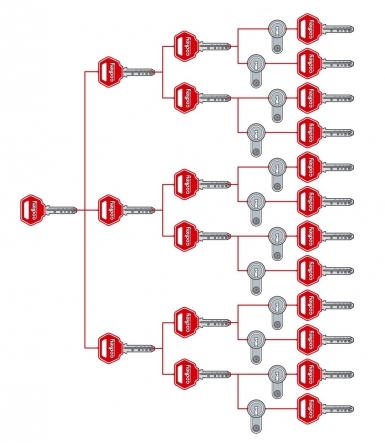 System of shared key - allows all users of the system with a key to open all doors. Suitable for single-family houses, small family businesses villas. The system is successfully applied and SOD in combination with combination lock with two locks. One lock is coded in Master system input, and the other - in the Master system SOD whose employees handle only one access key. Advantage: You have only one key for the entire building. In a fire, earthquake, flood, etc. can respond and save lives! System of Central patron - this system due to the configuration is suitable for residential buildings and office centers where a number of independent users share common areas such as entrance and garages. Optionally it is possible to add key for maintenance of common areas, such as heating facilities, air conditioning and more. Advantage: Each tenant owner has only one key! System master key - consists of a limited number of individual users who open their own room and master key that opens all the rooms in the system - schools, hospitals. Large master system - this is a system that adapts to organizational needs and allows users to enter different rooms with one key within the scope of their duties. 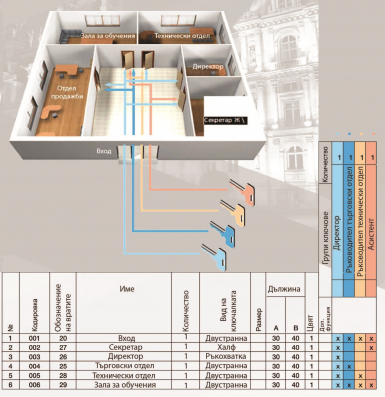 Typical users of this system are industrial sites, airports, hospitals, universities, hotels, administrative buildings.